Our intrepid reporter spends a week trying to write, browse the Web, edit photos, and even tweet on IBM's first PC. So how better to celebrate this important anniversary than by using the 5150 for what it was meant to do? Working on a 5150 seems to be a tall task in today's vastly accelerated computing world, however. Could a PC that’s as old as I am manage to email, surf the Web, produce documents, edit photos, and even tweet? Despite the vast improvements in computing power over the years, the basic job of a PC isn’t fundamentally different today from what it was 30 years ago. Early floppy discs were just too darned small! I was interested in spending more time with the Model 5150 because it's the foundation of so much modern computing. For the past 30 years, the platform created by the IBM PC has served as the basis for personal computing innovation and progress. Today, most people use PCs that retain some level of compatibility with a computer system released three decades ago. After careful thought, I sequestered myself in an infrequently used room in the upstairs corner of my parents' house. The bulk of Day 1 consisted of moving equipment over. I needed to take not only the PC itself, but also what seemed like 15 metric tons of supporting hardware that I could use for repairs in case the PC broke. Among those supplies were a few dozen ISA expansion cards (including spare video cards, serial cards, and the like), a couple extra 5.25-inch floppy drives, some tools, and a box of assorted cables. Day 2 began with a general survey of the PC. The first thing I did was open the case and assess what was inside. In the PC's five ISA expansion slots, I found a CGA video card, a memory expansion card, a floppy controller card, and a serial card for communicating with mice and other peripherals. For storage, my PC came equipped with a lone, full-height 5.25-inch 360KB DS/DD floppy drive. Thankfully, someone had maxed out the RAM at 640KB (yep, that's a massive 640 kilobytes--roughly 0.032 percent of the RAM on today's low-end PCs). When I looked for the processor, I found a surprise: One of this system's previous owners had replaced the Intel 8088 CPU with a Zilog V20 CPU. The V20, originally designed by NEC, was a pin-compatible enhancement of the 8088 that could run certain programs 30 percent faster than the 8088 could--even though it ran at the same 4.77MHz clock speed. But it wouldn’t be historically accurate to run such a speed demon for this challenge, so I replaced the V20 with an 8088 chip that I had in my collection. Next, I hooked the machine to my period-authentic IBM 5153 CGA monitor and booted it up. I briefly had some trouble with the video connector on the CGA board, but after I cleaned it a bit, everything worked fine. Then I encountered the next obstacle: a bad RAM chip. The POST error code told me exactly which RAM chip was bad (okay, I cheated and looked it up on the Internet using a netbook I had with me). Luckily, this socketed chip (a 4164C, to be precise) could be easily swapped out--but I didn't have a replacement on hand. Despite the malfunctioning RAM, the machine seemed to work well. The 5150 contains, as the Apple II did, a full version of BASIC in ROM that loads right up if you don't boot from a disk. Targeted mostly at computers without floppy drives (the lowest-priced 5150 sold with 16KB of RAM and no drives), this version of BASIC could save programs only to cassette tapes. You read that right: Like other personal computers of the era, the 5150 came equipped with a cassette port on the back. With the appropriate cable, users could save and load programs from a standard Philips compact cassette tape. The tech was slow and poorly implemented on the PC, but cassette players (and tapes) were orders of magnitude cheaper than floppy drives in 1981. Once I booted into BASIC, I noticed that the machine's display was stuck in 40-column mode (that is, capable of showing only 40 columns of letters on the screen at once). 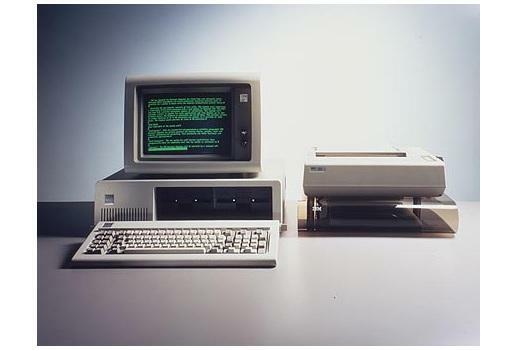 As a business machine, the 5150 supported an 80-column display. Switching it was possible, but I didn't remember how. Instead of a software-based BIOS, IBM equipped the 5150 with a series of dip switches on the motherboard for configuring basic system parameters, such as what kind of video card you're using, how much RAM the system has, and how many floppy drives are installed. I saw that all the dip switches on this PC's motherboard were set correctly for 80-column CGA, so I was stumped. Next I booted into PC DOS 3.3 (PC DOS is what IBM called its version of MS-DOS) off a floppy disk. Still 40 columns. Then I remembered that there was some way to change the video mode in DOS. I thumbed through an authentic PC DOS 3.3 paper manual to find the solution: A DOS command called "MODE" sets the video mode. The mode I needed was called "CG80," which set up a color, 80-column mode in DOS. Yes, 80 columns at last! Somewhere along the way, I decided to add a second 360KB floppy drive to make my journey easier. Thinking ahead, I had brought a half-height unit (pulled from another PC years ago) along from my house the day before. Doing serious work on a single-floppy-drive machine involves a lot of disk swapping, which is never fun.